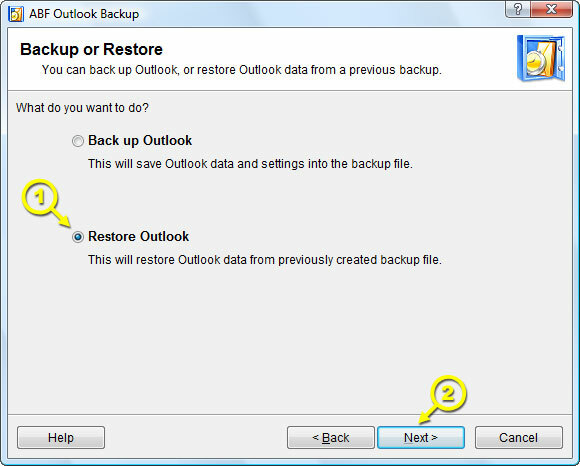 Restore is an operation to place the backed up data from backup file into MS Outlook. You can restore directly from the storage where your backup file is located. To start Outlook restore process, run ABF Outlook Backup, click Next on Welcome step - Backup or Restore step will occur. Select Restore Outlook (Figure 15; Pos 1) and click Next (Figure 15; Pos 2) to proceed to the next step. 1. You can always move data from an older to a higher version of Outlook without limitations. 2. You can move data from Outlook XP to Outlook 2000. 3. You can move data from Outlook 2007 to Outlook 2003, except IMAP accounts.